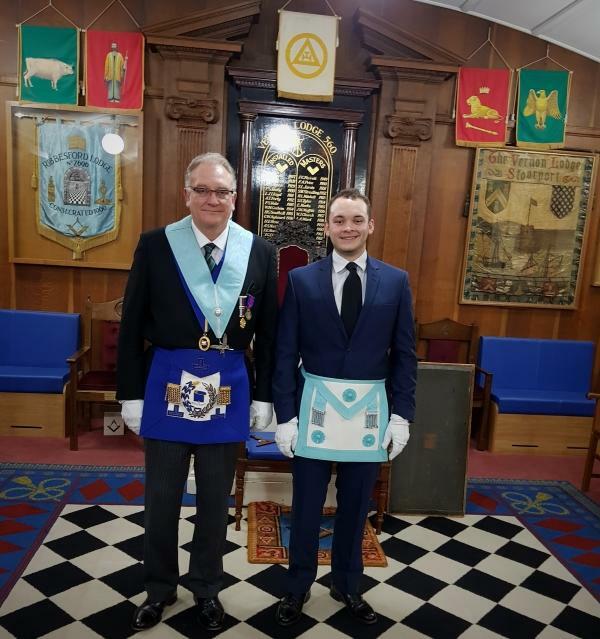 W. Bro Maynard Burton assisted with raising his Son Bro. Hugo Burton at the Vernon Lodge March Meeting. Ths March meeting at Vernon Lodge is traditionally a Past Masters evening, where the work is shared by past Masters of the Lodge. 1st Stourport (St Michaels) Scout Troop is taking a large portion of the group to the Netherlands to attend the Haarlem Jamborette, which is a large international camp where there will be around 4000 scouts from around the world. This will be a fantastic opportunity for the scouts to meet scouts from other countries and learn a bit about international scouting as well as taking part in lots of fantastic adventures. So that we can make this trip as affordable as possible to all those scouts who wish to attend we have set ourselves the target of raising £5000 to help support the costs of getting all our kit shipped over to the Netherlands. Vernon Lodge approached the Worcestershire Provincial Team for a donation for this worthy cause. W. Bro. Ian Redfern and Senior Deacon Bro. 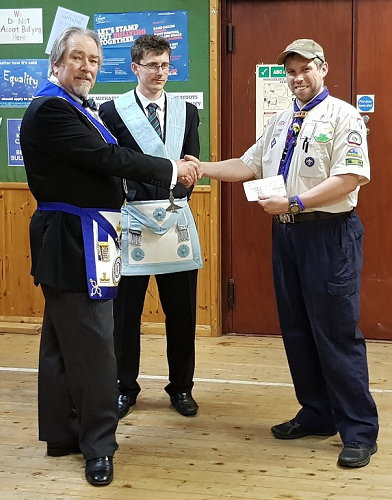 Aaron Bourne from Vernon Lodge met with The 1st Stourport Scout Group Leader, Mark Atkinson, to present him with a cheque for £500 from the Tercentenary Fund, towards their target.